Have you played in shaving cream today? If you haven’t, you are missing out in a fun activity which is great for sensory and motor development. One that can make your house smell great too! 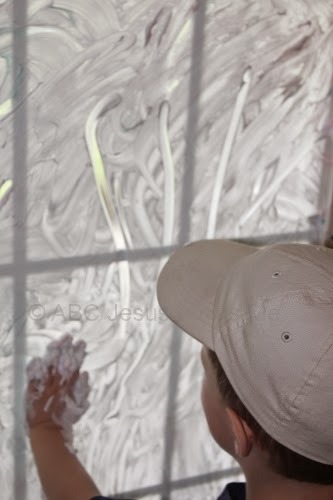 Shaving cream finger painting it part of the 2 Year ABCJesusLovesMe Curriculum. In the lesson plans I suggested placing shaving cream and finger paint in a shallow pan and wiggling your fingers all about. Great fun! 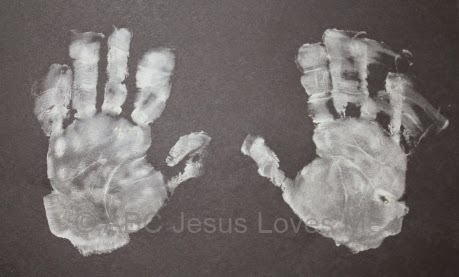 But on the ABC Jesus Loves Me Facebook Group, Kristina shared a new way to do this activity. A way that is much better. 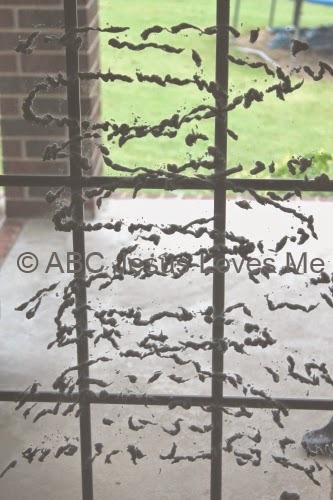 And it cleaned a glass window or door in our home. Win! 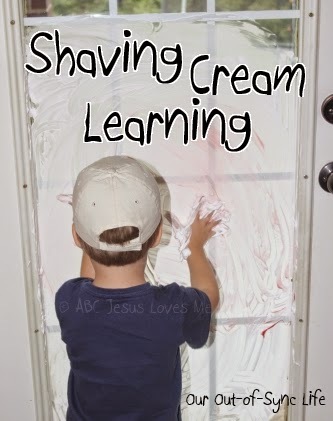 Begin by spraying shaving cream on a window, glass door, or mirror. Even though we didn’t have much drop on the floor, I would suggest a glass piece that is not over carpet – just in case. Before he began, I instructed Peanut to keep the shaving cream on the glass. (Not sure what shaving cream would do to paint or wood.) 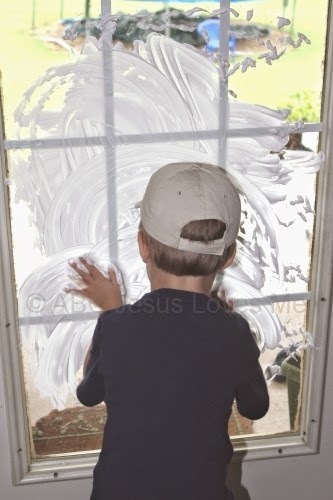 Standing at the door, Peanut rubbed the shaving cream all over the glass. If I do this activity again, I will remove his shirt. For extra fun, we added fingerpaint. This would be a great way to teach mixing colors. 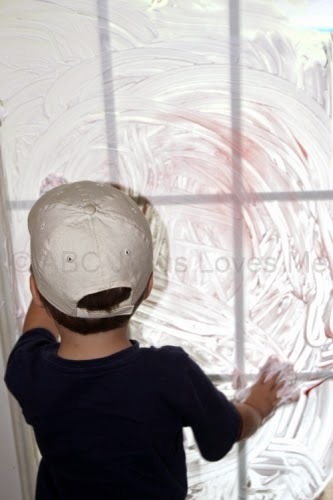 Moving the shaving cream around works the child’s senses – touch, smell (of the shaving cream), and sight. For children with heightened since of touch or smell, this could be a very difficult activity. Discuss with an Occupational Therapist how to introduce this activity if it is too much for your child. 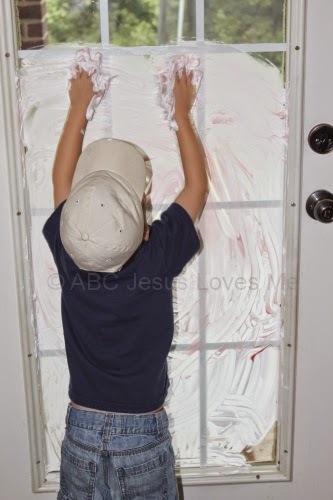 By placing the shaving cream on a vertical surface, the child has to work his core and large muscles. See the gross motor work Peanut is doing reaching as high as he can to get the shaving cream up to the top? After he had played in the sensory cream for a while, I explained that we were going to have some writing time. I instructed him to do different writing patterns in the shaving cream but assured him after he obeyed my requests that he could resume his free play. You can see that Peanut drew lines (or L’s or 1’s depending on the objective at hand.). We also worked on him writing His name over letters that I wrote for him. Practice drawing letters, numbers, shapes, or even people. This makes the activity great for fine motor skills (working the small muscles). After finishing his masterpiece, his hands and arms were covered with shaving cream. I grabbed a piece of black construction paper and instructed him to place his hands on the paper. He made these great hand prints! Thank you Kristina for sharing this fabulous idea! Previous Post: « What Do You Want?